We woke up early the next day to a cloudy dawn. The sky was thick with clouds, especially up the valley and above us on the Lata ridge. Dhauli Ganga’s roar had subsided to a persistent murmur. Mountain rivers are at their calmest at dawn, before the sun has had a chance to melt the higher glaciers that add to the volume of water. A little later, as the sun rose to blow away some of the surrounding gloom, obstinate tendrils of vapour still clung to the stupendous aiguilles up the valley that formed the outrunners of Dunagiri. The peak itself couldn’t be seen from Lata due to the Lata Kharak ridge above us, but these needle-like rock pinnacles framed the gorge beautifully. Parth and me were packed and ready. Raghubir was overseeing the rations, the stove and fuel being packed. In a little while the sun broke through the upper reaches of the gorge, and slanting rays of sunshine illuminated the rich forests above Lata. I learnt from Narendra that this was the first trek in the sanctuary since a couple of treks in June, before the monsoon had set in. Those didn’t go too far, only till Lata Kharak and further till Jhandi Dhar, before turning back. So if we managed to get through to Dharansi, it would be the first time in about a year anybody in the village would have gone that far. Our little trek was also an opportunity for Lata’s men to go clear some of the upper parts of the trail, collect wild herbs that are necessary for their culinary and medicinal needs, and also check up on supplies and belongings that had been stashed at various points on these trails earlier in the year. So our party was going to be fairly large, at least up to Lata Kharak. There was Narendra and Raghubir, as well as Narendra’s childhood friend, a green-eyed handsome man called Lakha Butola; the quiet and stoical Inder Singh, and a relative of one of them- a quiet, schoolmaster-looking man. After a quick breakfast, Narendra, Parth and I left around 8. The others, would catch up with us later- not a particularly difficult task, given our as-yet unacclimatised legs and lungs. Parth was carrying only his photography equipment, I was carrying my full rucksack, and Narendra had his own rucksack as well as Parth’s. From Lata, a path climbs steeply through the forest to cover the 12 km to the top of the ridge at the bugiyal of Lata Kharak, a brisk 5338ft. That’s enough to knock the wind out of even a seasoned pair of lungs, so we aimed for Kanook, a cliff top clearing roughly halfway up the ridge in the middle of the forest. It was a bright, beautiful day. The sun had burned out most of the clouds, and the air was fresh and invigorating. The Nandashtami celebrations over, the village children were on their way to school, a neat large one-floor building surrounded by a yard a little way above the village. 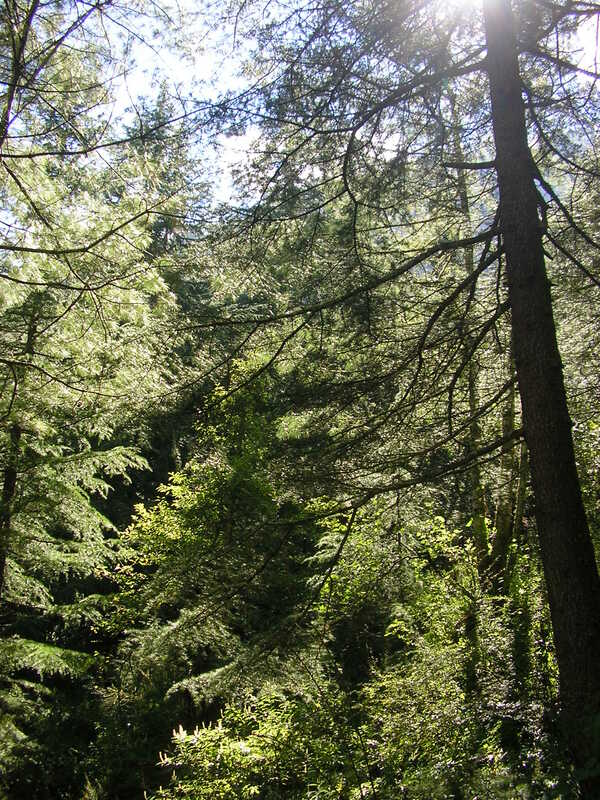 Beyond this, the path climbed leisurely through a grove of deodar trees. These kings of Himalayan flora rise to an average of 80 feet from the ground, casting long shadows across the slope. Like most such groves in the region, this too is considered sacred and and felling is strictly frowned upon by the village. These magnificent trees had been saved a generation ago by the women of these villages, and walking in their cool shade, I felt a great sense of well-being wash over me. Occasionally the peace was shattered by the deep, rolling explosions. 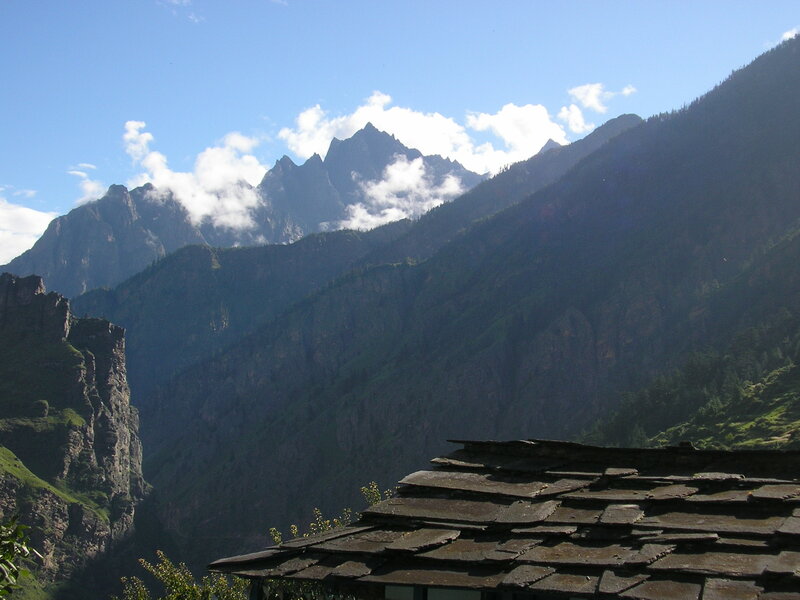 The ITBP were dynamiting the mountains somewhere below us to widen the road to Malari. It’s a deeply worrying things to do, especially in precipitous gorges, as it weakens the rocks and leaves these very roads open to landslides. Needless to say, the noise can’t be a good thing for the animals in these forests. Beyond this belt began a higher belt of mixed pine trees, and the keen scent of resin increased. As did the humid heaviness of monsoon. Soon I was perspiring freely as we climbed up through the dappled sunlight of this magnificent forest. Slender spider webs twinkled like jewels in the sun. Pretty little alpine flowers dotted the track low-lying bushes exploded in a burst of primary colours. Beetles buzz around on short wings, describing pretty parabolas in the sunshine. Forests in the monsoon come alive with an ardour that is so strong and grasping that it can be pretty overwhelming. Amidst all this beauty, insects bite you and lick you, unseen creepers try to trip you up, stinging nettles jump up at you at uncomfortable moments and the strong noonday scent of resin gives one a headache. One undeniably good result of the national park status has been the boost in the area’s wildlife. 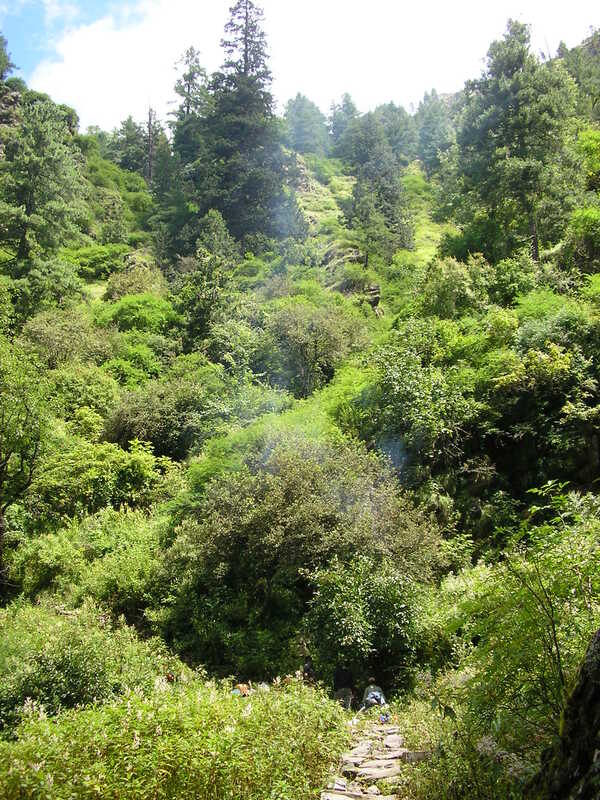 Along with the vegetation being given a fair chance to regenerate itself, vastly reduced human interference has boosted the numbers of many animals indigenous to these Himalayan upland forests, from black bears to leopards and bharal. However, these monsoon months often lead to problems. As Raghubir and Narendra never ceased to tell me, this fecund season is when their territorial struggle with the numerous black bears and jackals and leopards is at its most intense. However, since this is nothing new, all that the villagers do is to lock up securely at night, and if necessary band together in groups and create enough of a ruckus that drives the bears away from their fields. Despite being competitors, the affection and knowledge that the Bhotiyas possess for their wildlife is incomparable. We stopped for lunch in the forest glade of Bhelta, beside the little nala of the same name. In drier months, this is a campsite, but in this riot of vegetation, it’s not a particularly comfortable place to camp. It’s a lovely spot for lunch though, right next to the flowing brook. We were already quite high up. From breaks in the foliage, we could look back at Lata village, now a small group of white buildings further down the ridge. 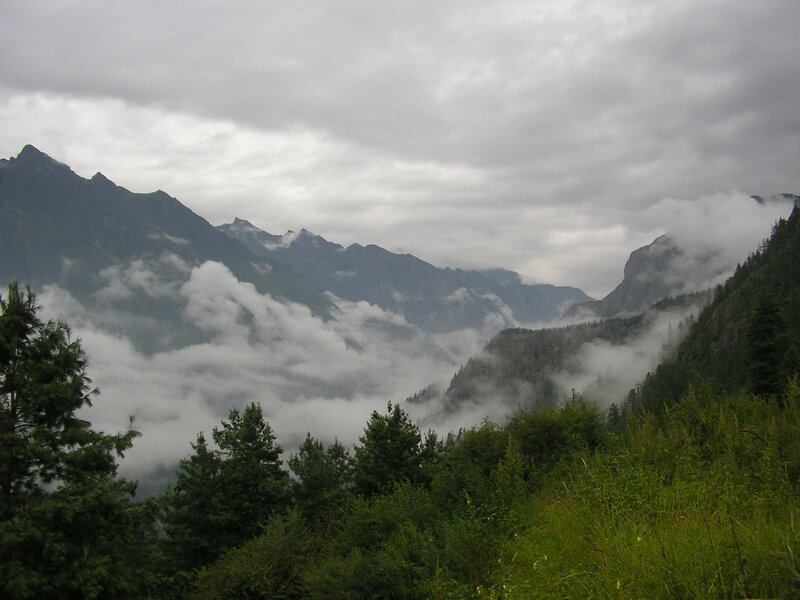 Further east, the bugiyals below Kuari pass were cloaked in clouds. Birch, walnut and pine trees crowded around the brook, and the buzzing of large, lazy flies grew more intensive as the afternoon drew on. Lunch over, we shouldered our packs for the final steep rise to our camp for the day. Kanook, at 9400ft, commanded a fine view of the Dhauli valley. A thick haze hung on the noonday forest that stretched away under us towards the distant Lata village. Stray sounds occasionally floated up the valley. Flies lay sluggishly on warm rocks as we stamped down a wild outgrowth of weeds to make a clearing for a tent. 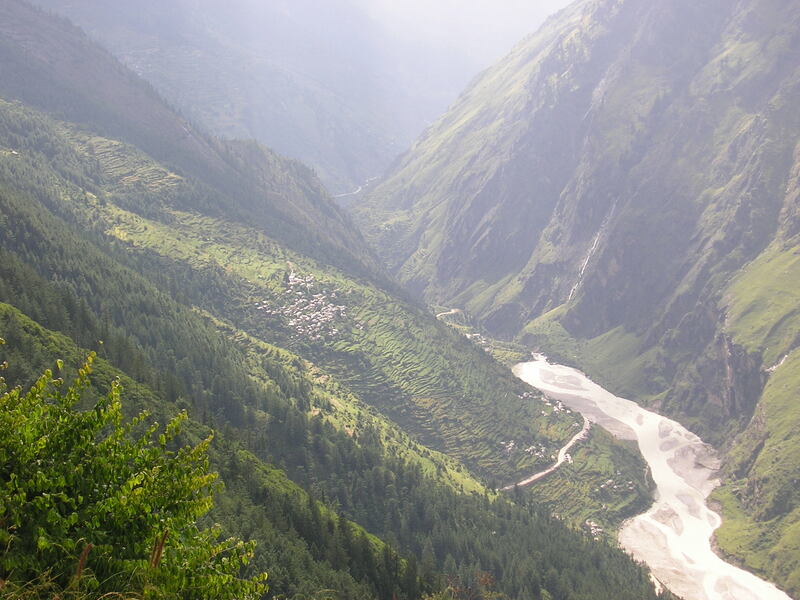 Above us rose the jagged boulder strewn ridge of Saini Kharak that divides the Rishi and Dhauli valleys. Just beyond that serrated ridge boiled a massive sea of rain clouds, not quite spilling over. Meanwhile small tufts of valley cloud drifted up from the gorge and catching a breeze they’d then start grouping together in dense little clusters, gradually covering the valley floor. By sunset all was invisible under thick layers of purple clouds. “Beetles buzz around on short wings, describing pretty parabolas in the sunshine.” 🙂 Love it!